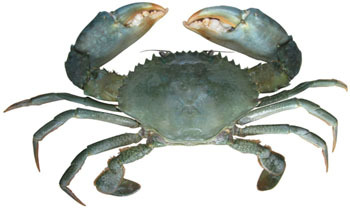 Scylla serrata, commonly known as the Mud crab , Green crab or Mangrove Crab *-, is an economically important species of crab found in the estuarines and mangroves of India. In their most common form, the shell colour varies from a deep, mottled green to very dark brown. There has been a huge interest in the aquaculture of this species due to their high demand/ price, high flesh content and rapid growth rates in captivity. It has a huge market demand all over the world, particularly in South East Asian countries which make it as a potential candidate species for commercial level aquaculture. This seafood delicacy is considered as one of the tastiest of all crab species. This is available worldwide and is mostly sold live in international markets. This species is widely exploited from all along the coastal belt of India. In India, mud crab farming started during early eighties and now crab culture is developing very fast in the states of AP, Kerala, West Bengal and Odisha .